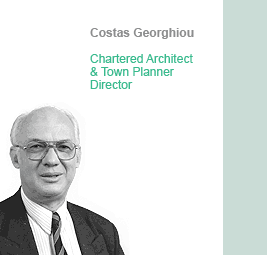 Costas Georghiou B.Arch(Hons), RIBA, MCD, MRTPI is a Chartered Architect and Town Planner with over 40 years experience in Architecture, Urban Design, Town Planning, Development and Regeneration. He has worked in the private and public sectors in the U.K. and overseas in senior positions. He was Chief Planning & Highways Officer for Wolverhampton City Council between 1993 and 2006; Head of Planning & Building Control for York City Council 1988-1993; Head of Urban Design for Bristol City Council 1975-1988. Before that he practiced as an Architect and Urban Designer in London, Cyprus, the Middle East and the Gulf. Costas has many years experience as an External Examiner for postgraduate courses in Architecture, Town Planning, Urban Design and Regeneration at York, Bristol (UWE) and Reading Universities. He was appointed Visiting Professor of Architecture & Urban Design at the University of Wolverhampton in October 2006. Costas is also a Member of the Urban Design Group and an active contributor to professional, local, national and international forums. He is a founding member of the Sino-British Collaborative Project for the Development and Conservation of Ancient Chinese Cities, 1991-2001, set up between the Chinese and British Governments. He is currently the Vice-Chair of Wolverhampton & District Society of Architects. Work done by Costas Georghiou has won many national and international Awards, including the RTPI for Planning Achievement; Europa Nostra and the Green Organisation.